Hundreds of worshippers flocked to a Kenton church to catch a glimpse of a rare Christian artefact many believe was part of the very cross on which Jesus was crucified. 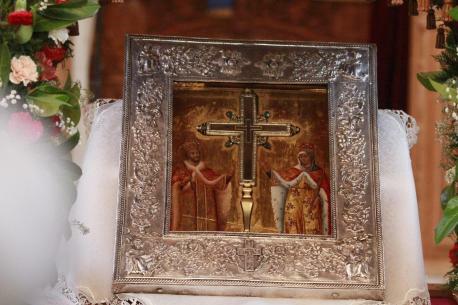 The fragment of the True Cross, recognised by Greek Orthodox and Catholic followings, arrived from Jerusalem amidst high security at the Holy Church of Saint Panteleimon and Saint Paraskevi in Kenton this morning. 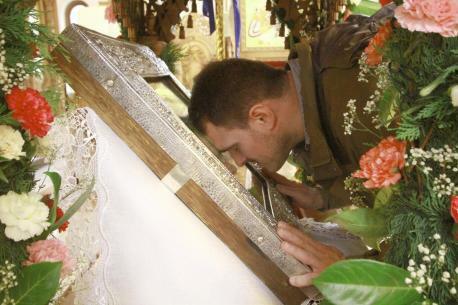 A series of special services were held throughout the day by priests who flew over from Greece especially for the event, while worshippers travelled from as far as Kent to touch, kiss and pray in front of the relic. Parish priest at the Kenton Lane church, Anastasios Salapatas, spoke about the event he said was one of the biggest in his 30-year ministerial career. He said: “It has brought out a lot of emotion in people. Some people with disabilities and illnesses have come to touch the cross – some just want their prayers answered. The True Cross is believed by some historians to have been discovered by St Helen when she travelled to Jerusalem in 326-328AD. A number of fragments exist at churches around the world. 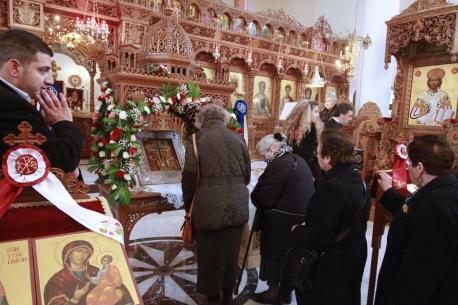 Church representatives from across the country came to see ornate icon. Among them was Marios Minaides, chairman of the Association of Greek Communities in Great Britiain, who represents hundreds of Greek Orthodox followers across the country. Marius Ionescu took his wife and son to the church to touch the sacred object. He said: “It is the most holy object in the world – that word holy is almost not enough to describe it.